Hangtags are creative and effective marketing tools incorporated by large and big businesses into their marketing efforts to get quick results. It helps them to standout and put the message across in an innovative way. 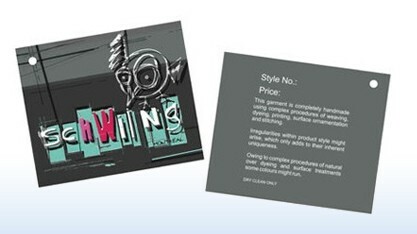 We S S Graphics are experts when it comes to hang tags printing. Our designers understand that every business is unique. Understanding the need of your business they will come up with a one-of-its-kind industry specific design with enough space to put up the basic information in a quick way. We give a lot of importance to shape, ordinary outline will not gain much eyeballs like an innovative one like a tooth shaped hang tag for the dentist or a comb shaped one for a saloon. We believe they are successful depending on how you make them, so to create that perfect one we invest time and do a lot of brainstorming, the final result is a hang tag that will do wonders for your business. Try us for hang tag printing. We, S S Graphics are the leading printing solution providers operating from India. Our topnotch printing quality, affordable cost above all customer centric approach has made us the leaders in the printing industry. Hang Tags Printing is Easy! Hang tags are generally used for labeling items, listing product details, detailing usage instructions, and promoting brand identities. A hang tag is a quick and easy way to drive sales and enhance brand recognition and also attract new customers. The hand tag should be designed professionally as it significantly influences your information's presentation and impact. A Full color printed hand tag will grab more attention and connect with your customers on a deeper level than simple black and white. Hang tags reinforces your product image and your brand thereby giving you the opportunity to show customers the product in use.